How was everyone's weekend? I had a lovely time, soaking up the sun (shock horror) and loving the fact that Spring has finally sprung! It was so nice on Saturday that I actually went out with a really thin jacket on, which made a nice change from all the thick wintry coats I've been wearing recently! I don't know why, but I have a feeling this summer is going to be a scorcher. Finger's crossed! 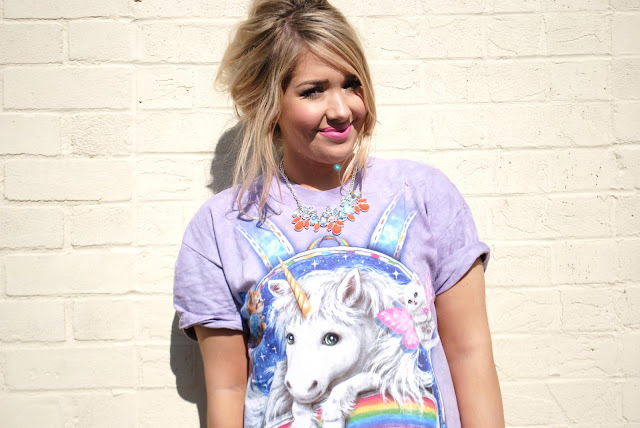 Seeing as the weather was feeling bright and pretty I decided to don my gorgeous new Unicorn tee from Gigi Vintage. I only recently discovered them after Claire posted about this top on Instagram, and I just had to have it. I ordered a size L, and it is REALLY oversized, but I love it. When I first opened it I was a bit like,'Wow, it's huge' but I actually like it this way. It's long enough to wear with leggings etc., but I also think it will look amazing with high-waisted skirts and shorts over the summer. 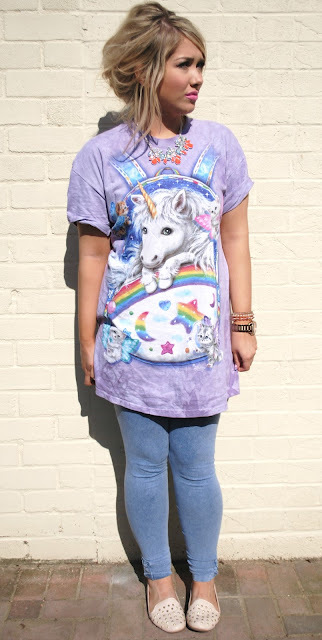 I have my eye on this beauty from Gigi Vintage too - I am seriously addicted to Unicorn tops! 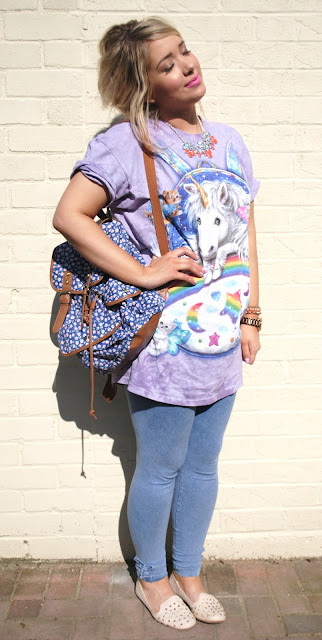 I wore it with my trusty old jeggings and my cute little rucksack from Peacocks, which I can see me wearing a lot over summer - rucksacks are definitely here to stay! I've been wearing my hair up a lot more recently, what do you think? I really want to master the big top knots I've been seeing people with lately, but I'm still working on it! I have a feeling lots of back-combing might be involved! I've got an exciting week ahead; heading down to London on Wednesday for the Motel press day and AX Paris Circus event, which I am SO looking forward to. Then I'm back in London again on Saturday for a meeting about something I'll be posting about over the next couple of months, really excited to share it with you!